Along the past decade, a new evolution has become an indefinite trend. A new rule has declared its presence and set our minds to a looping mode. Meanwhile, people tend to aimlessly walk around with no care in the world, accepting the fact that such occurrence has happened and it’s okay! 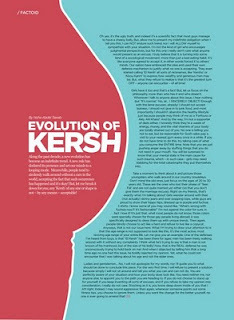 But, let me break it down for you; ANY ‘Kersh’ of any size or shape is NOT – by any means – acceptable! Oh yes, it’s the ugly truth, and indeed it’s a scientific fact that most guys manage to have a cheesy belly. But, allow me to present my indefinite obligation when I tell you this; I can NOT endure such trend, nor I will ALLOW myself to sympathize with your situation. I’m not the kind of girl who encourages judgmental perspectives, but for this one I really don’t care what anyone would present as an excuse. I truly believe that it is turning into some kind of a sociological movement, more than just a bad eating habit. It’s like everyone agreed to accept it, in other words forced it to others’ minds. Our nation have embraced the idea and used their own defense mechanism to justify what no one is accepting. They even started calling ‘El Kersh’ all sorts of nicknames, like ‘Kersho’ or ‘Abou Karim’ to express how wealthy and generous men may be. But, what they refuse to realize is that it’s the greatest turn OFF – anyone can encounter – of all time! Girls have it too and that’s a fact! But, let us focus on the philosophy more than who has it and who doesn’t. Whenever I talk to anyone about this issue, I hear nothing but “It’s normal.” No, sir… I SINCERELY OBJECT! Enough with the lame excuses, already! I should not accept laziness, I should not give in to junk food, and most importantly I shouldn’t abandon the healthy lifestyle just because people may think of me as a ‘Farfoura or Akly Akl Khass!’ And by the way, I’m not a supporter of diets either. I honestly think they’re a waste of energy, money, and the vital vitamins of your body are totally drained out of you. No one is telling you not to eat, but be reasonable for God’s sake; pay a visit to your nearest gym every once in a while. If you do not have time to do this, try taking care of what you consume the ENTIRE time. Note that you are just pushing anger away by stuffing things that you do not need in your mouth. You will be surprised to know that your mental state is the main cause for such trauma, which – in such case – girls may need stabbing for the total catastrophe they put themselves into. Take a moment to think about it and picture those youngsters who walk around in our country nowadays. Don’t mind the old ones, just focus on the ages of 20 to 30 years old. These are the ones who lost their phase of ‘Teen Fat’ and are not quite married yet either (so that you don’t give them the marriage excuse). Right on my friends, that’s exactly what I’m talking about! Girls wander around with their (not actually) skinny jeans and over-popping tops, while guys are proud to show their hippo hips, dressed up in purple and fuchsia t-shirts. I know some of you may sound like, “What’s wrong with fuchsia now?! It’s fashionable!” I’m not against the color for sure, in fact I love it! It’s just that, what most people do not know, those colors were specially chosen for those gay people living abroad; it was specifically designed to dress them up with unique trends. Then again, people blindly choose to act like a herd and refuse to live like a copycat. Anyways, that is not our issue here. What I’m trying to draw your attention to is that this age range is not supposed to look like this. It’s the most active, most reviving age range of your entire life. Let me give you an example. One of the defenses I’ve heard from boys, is that “El Kersh” has been there for ages; men has been freely walking around with it without any complaints. I think what he’s trying to say is that a man is not known of his manhood, but of the size of his belly! Now, that is the REAL defense he was unconsciously trying to hold back on me! And when I objected by telling him that a long time ago no one had this issue, he boldly rejected my opinion. Yet, what he could not encounter that I was talking about his age and not the elder ones. Ladies and gentelemen… No, I will not apologize for my words, nor I’ll guide you to what should be done to conclude this piece. For the very first time, I will refuse to present a solution because simply I will not sit around and tell you what you can and can not do. You are perfectly aware of your situation and how your body does look like. You need neither me, nor anyone else, to appoint you to the path you are heading to. If you do not choose to stand up for yourself, if you keep inventing all sorts of excuses, and if you refuse to take my opinion into consideration, I really do not care. Shocking as it is, you know deep down inside of you that I AM right. Indeed, I may sound aggressive; then again, whenever someone points out some fitness tips, you choose to ignore them. Unless you want the change for the better yourself, no one is ever going to amend that! Very well expressed , Noha . Keep it up . You are a real "Eye opener ". Thank you so much Ahmed. It's an honor to receive such comment from you. Thx again!